On Wednesday, LMP parliamentarian and national security committee member Bernadett Szél held a joint press conference with László Majtényi, founder of the Eötvös Károly Institute, to discuss the implications of Fidesz’s war on NGOs and the use of Hungary’s national security services for political purposes. Szél and Majtényi’s remarks implied that lines are blurring between politics and national security: Hungary is well on its way to becoming a police state. 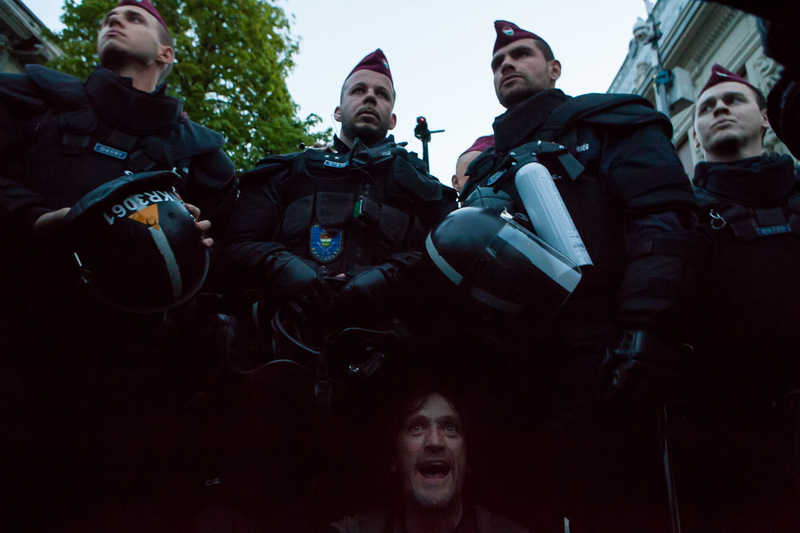 Last week, following a meeting of the national security committee, Fidesz vice-president and committee co-chair Szilárd Németh publicly claimed that Hungary’s secret services see a “serious risk” that street riots will take place before the upcoming national election. Németh proceeded to name three opposition activists whose names had been brought up during the committee’s closed meeting. At Wednesday’s press conference, Szél lambasted Hungary’s ruling party for intentionally using the committee for political purposes. Németh’s campaign against the “Soros network collaborating” NGOs is completely baseless. Németh broke the law when he divulged specifics (which are classified) of what was discussed during the meeting. Szél said she tried to file a criminal complaint against Németh for divulging classified information, but Hungarian law does not allow her to do so because she personally has no standing in the matter. According to the law, neither Szél nor the individuals named by Németh can file a criminal complaint in the matter. The only one with standing in this case is the entity responsible for classifying the information — the Constitutional Protection Office, Hungary’s internal security agency. According to Majtényi, the situation in Hungary now is reminiscent of the Soviet Union in the 1980s, where critics of the one-party state were ruled insane, locked in asylums, and given electroshock treatment. Majtényi, citing historian István Bibó’s remarks in the 1950s, said “every manifestation of this brutal state must be ended.” Majtényi later added that all this must be done within constitutional limits, adding that the problem is far greater than just Szilárd Németh; it is about a systemic problem. Emese Pásztor, a junior researcher with the Eötvös Károly Institute, then took the floor to address the government’s draft bill that would modify a law on secret information gathering. The law was struck down by the European Court of Human Rights (ECHR) in January 2016 after the court found that the state’s security services were able to conduct secret surveillance of citizens without judicial oversight or suspicion that a crime had been committed. Hungary’s Ministry of Interior was compelled to modify existing legislation to conform with the ECHR’s ruling. In August 2017, the Hungarian government released its draft bill. The bill states that the National Authority for Data Protection and Freedom of Information (NAIH) would be responsible for supervising the secret gathering of information, whereas the ECHR recommended judicial control. The bill states that warrants for secret information gathering are to be issued by the justice minister and that the NAIH could only issue an opinion of the warrant. In other words, the security services could perform secret information gathering of citizens for up to a week before the NAIH could shut it down. The ECHR recommended that warrants be issued by an entity independent of the executive, such as a judge. The bill also introduces an ex-post remedy to citizens targeted by secret information gathering. Such individuals can submit a “surveillance complaint” to the NAIH. But the Eötvös Károly Institute says this remedy is no good in its current form, and instead calls on the government to take steps to ensure citizens targeted by secret information gathering are informed when it no longer poses a threat to national security.